The Wolturnus Hawk has changed my life in the best way possible. It has given me my independence and freedom without compromising on style or comfort. As I travel in cars a fair amount, it is important that a wheelchair is small and light enough and the Hawk definitely covers that! It is compact enough to be able to fit into almost any boot or even on the backseat. Another bonus it that it is extremely easy to assemble as the frame is so lightweight which also helps out when using and manoeuvring the wheelchair. Just a short thank you note to express my gratitude to the entire team at Albion. I was clearly reluctant to accept that I required the use of a mobility scooter; however the one to one attention and patience showed by the staff very quickly put me at ease. Your interest in meeting my needs was always obvious, as was your integrity in offering a first class item at the keenest price available. Having been a customer of Albion Mobility for a few years now I can thoroughly recommend them. As a family firm they go out of their way to ensure that they see you as more than ‘just a customer’, I have recommended them to several fellow wheelchair users and they have all been delighted. – T Eakin. I have nothing but admiration for the way Albion Mobility is run: courtesy, patience, care, ready humour, welcoming smiles and perceptive attention to detail. – A Crispin. I have never had a more professional service or been measured so thoroughly for a wheelchair before. I am more than happy to recommend your Company to other wheelchair users. – I Morris. I was very impressed with the way both [Mhairi] and [Gavin] worked with the chair yesterday and the assessed chair is spot on for meeting my client’s requirements. I’ve used Albion Mobility in the past for servicing and maintenance of my wheelchair. When I decided to replace it, I’m really glad I called you as the service I’ve received from my initial chat, to my assessment with Barbara was just fantastic! I felt that I was truly listened to throughout the whole process with the end result that the Ti Lite ZRA and Jay backrest that was specified and ordered is just perfect for my needs and is already the best wheelchair I’ve ever owned! It’s also reassuring to know that the support is there should it ever be needed. My new chair runs like a Rolls Royce this is the best chair I have ever had; it is just perfect. I went to Albion Mobility to replace an existing Küschall K-series. I am double amputee so getting the balance right was important. Barbara advised on improvements she would make to make life easier: better rolling castors, ergonomic hand rims and a tighter front end to make turning indoors better. The balance and turning are spot on. I also have skin issues again following Barbara’s advice and a trial I now have a Vicair cushion which provides comfort but more importantly stability. Just a short email to say thanks for my new Invacare wheelchair your service was 2nd to none. I have to thank Barbara for fitting the chair to my requirements. The best bits are the lifter and the lights. The excellent advise and service offered by Albion Mobility and their staff was outstanding. I first contacted Team Albion to find out about off road wheels for my existing rigid chair. I was offered an appointment without delay to evaluate me and my requirements; I was very impressed with the options offered and the full explanation of them. I left satisfied that I was being offered the correct wheels for my intended use. When I decided I wanted a folding chair I was quickly given another appointment, having done my research online and I arrived with preconceived ideas of what I needed. Barbara took much time in finding out about me and what I wanted the chair for. She then showed me a chair that I had not considered but with plentiful options to give me my ‘perfect’ chair. Upon delivery Alex took time and care to ensure everything was as I expected. He then took me through the technical practicalities and the back-up that went with buying a chair from Albion Mobility. 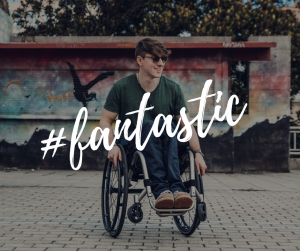 A person confined to a wheelchair can often find difficulty in purchasing the most suitable wheelchair and cushion for their needs especially if these items are bought for the first time. 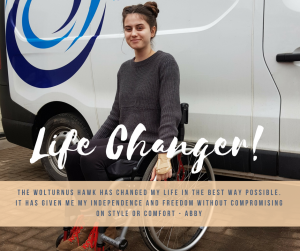 I have been in a wheelchair for over 50 years, made many purchases throughout the UK and wish to comment on the excellent advice and service offered by Barbara and her staff at Albion Mobility. Throughout my purchase experience I felt a genuine desire by Barbara to select the chair and cushion that was just right for my needs and my way of life. I was very impressed with the level of personal care shown to ensure the wheelchair was fit for my needs, competitively priced against even internet dealers and delivered and set up to the highest standards. The whole experience was one of enjoyable excitement and anticipation (as it should be) and has left me very confident in my purchase. – D McDonald. We were impressed by the amount of time you were prepared to spend with us for the important task of demonstrating, adjusting and tailoring the chair to suit my (son’s) needs. Thank you for your patience and understanding. – G Kilmurray. My poor dear long-suffering wife has over the years had to put up with many occasions when I rebelled against poor service and made my feelings known forcibly to the people who had, in my mind, fallen sadly short of acceptable service. However, when people excel themselves, I also let them know, so here I go. Please forgive my ranting, it is part of my Kintyre upbringing. The Ottobock wheelchair that you provided has been a real treat to me. The only way it might have been bettered would be is if central heating was installed to combat the current cold spell! 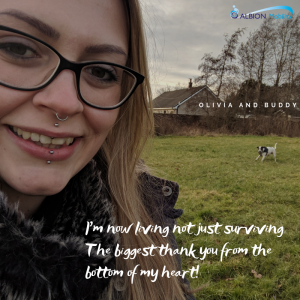 It has made a huge difference to my life. Thank you, and the makers. The one wee worry I had with a slight noise from the chair was resolved by you very quickly indeed. We also had a wee problem with the crane that was fitted by the people you recommended. They resolved the problem, which was due to my dear wife having misunderstood the operating instructions, inside 24 hours. You, and the fitters of the lifting device have provided services that are beyond reproach. Thanks from my wife and myself, for your excellence. The only bad thing about it all is that nowadays the only pleasure I get is in complaining and no matter how hard I try, I cannot find anything to moan about. Thanks to you all – Tommy Ralston, Fife. Iona is absolutely loving her new wheelchair, its given her total freedom and I can’t keep up with her in Union Square on our shopping trips. Thank you so much for the support with the Force R. It’s made a huge difference and it’s so great that there will at last be a handcycle supplier in Scotland. Thank you. – Karen Darke. Thank you so much Albion for your excellent care. Fantastic MOT today on my power wheelchair. The annual checks make a huge difference in the performance of the chair. It’s not only reassuring, but the care given means I know better what to look out for in regards to potential faults.  Such a friendly and supportive company – a delight to recommend highly. You should be so proud of what you guys do! Thank you for being such a lifeline to our family. Looking forward to enjoying time out and about on my chair. – Client L.M. Specialists in prescribing mobility aids.